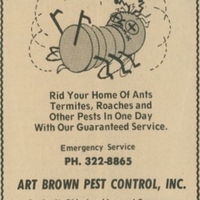 A newspaper advertisement for the Art Brown Pest Control, Inc., located at 2562 South Park Avenue in Sanford, Florida. Art Brown Pest Control was incorporated in Florida on March 28, 1974. It's officers included Roberta Crabtree, Bill Spencer, Donald R. Rogers, and Patricia A. Spencer. The company was voluntarily dissolved on October 5, 1990. Original newspaper advertisement: The Evening Herald, May 13, 1975: Private Collection of Beatrice Gestrich. Digital reproduction of original newspaper advertisement: The Evening Herald, May 13, 1975. "ART BROWN PEST CONTROL, INC.." Florida's Companies. http://www.companies-florida.com/art-brown-pest-control-inc-9r0i/. 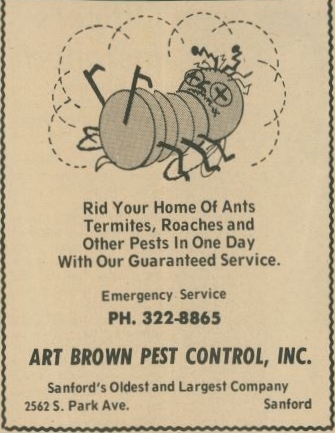 “Art Brown Pest Control, Inc. Advertisement.” RICHES of Central Florida accessed April 25, 2019, https://richesmi.cah.ucf.edu/omeka/items/show/5799.